I have sometimes thought that if wars could be shown in slow-motion, we could put an end to this barbarism that gives the lie to all claims of “civilization” and “humanity.” Gaza Writes Back is one of those very rare books that depicts war in slow motion. The 23 stories here, written by 15 young authors (from late teens to early 30s, all but three female) were compiled to commemorate the five-year anniversary of “Operation Cast Lead”—the name Israel gave to its 2008-2009 campaign to once more (but not finally) “mow the lawn” in Occupied Palestine—mostly, in this case, in Gaza. It is a book that vivifies and personalizes the horrors, but also adumbrates the gnawing losses, the indelible memories. Two other remarkable facts about this anthology is that many of the stories originated as blogs, and that all of them were written in English by non-native speakers! No mis-interpolations by well-meaning and not-so-well-meaning translators. Every story is at least well-written and worthy of anthologizing, and some are as brilliant and unforgettable as any short story by Hemingway, Katherine Mansfield or Frank O’Hara. In these stories, the dead and dying have a second chance to live again. They are stories in slow motion—and with context. Stories that provide the heart-context that articles—even by gifted writers—cannot provide, by their generic nature. Here are stories of resistance, and terrible loneliness, too. “I realized that I will be all alone after your and your father’s martyrdom. You are alone, and I am alone. You will stay alone. I will stay alone. You died alone, and I will die alone. That night, I missed your warm breaths, harmonic heartbeats, and charming smile. That night, I lost my son,” writes Shahd Awadallah. You cannot uproot an idea! Palestine has been a vibrant idea for thousands of years, a living land with generations renewing the promise decade after decade. Nour Al Sousi, Sarah Ali, Nour El Borno, Jehan Alfarra, Yousef Aljamal, Wafaa Abu Al-Qomboz, Tasnim Hamouda and the others mentioned above have invited us into their homes, to sit at their tables, to be nourished with their stories and their lives. To share with us — their guests…their kin. 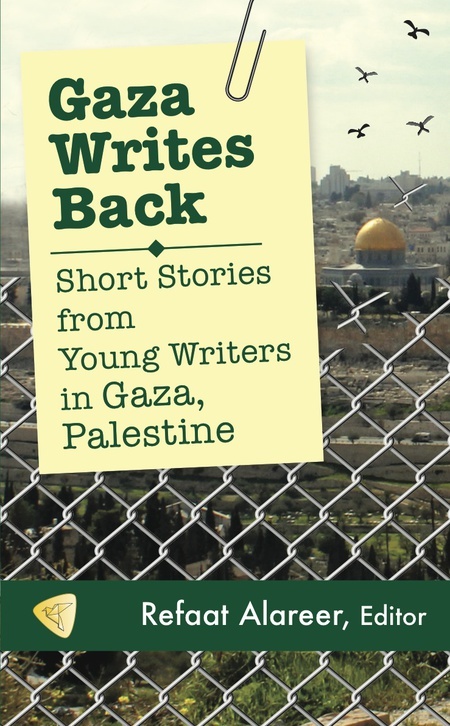 Gaza Writes Back: Short Stories from Young Writers in Gaza, Palestine. Edited by Refaat Alareer. Just World Books, Charlottesville, VA, 2014. 205 pages. http://bit.ly/GazaWrites. Gary Corseri has performed his work at the Carter Presidential Library, and his dramas have been produced on PBS-Atlanta and elsewhere. He has published novels and collections of poetry, has taught in public schools, prisons and universities, has published work at The Seattle Star, The New York Times, Village Voice, Redbook Magazine and hundreds of publications and websites worldwide. Contact: gary_corseri@comcast.net.